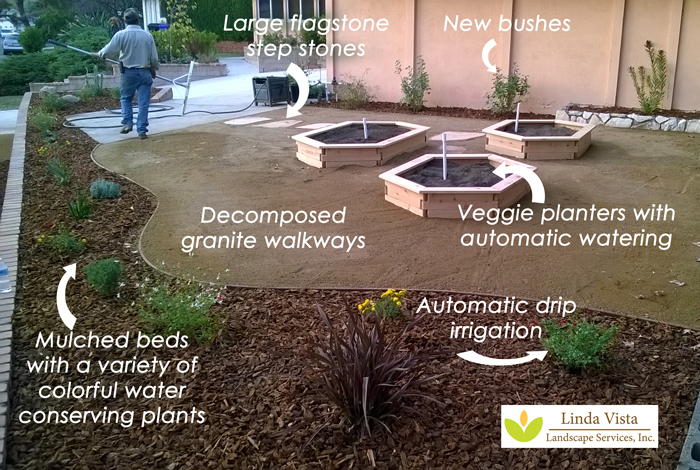 Water Conservation with Veggie Garden - Linda Vista Landscape Services, Inc. 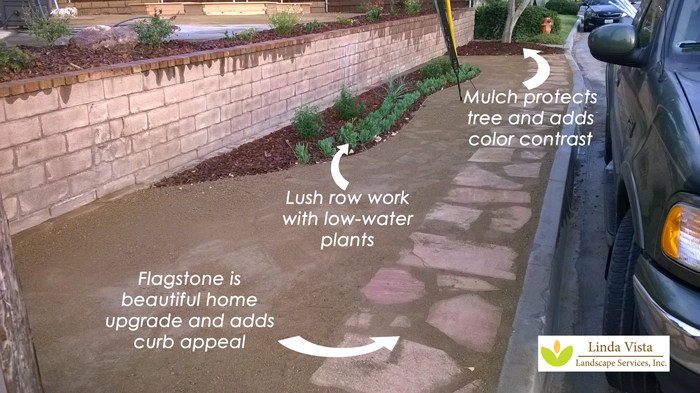 This La Crescenta project was a beautiful opportunity to create some amazing curbside appeal while still being true to water conservation, low-maintenance gardening, and fun with a veggie garden — in the Los Angeles area. With the property front being a two-level landscape situation, the design called for a bit of imagination. As you can see here, there was grass running the length of this corner lot’s front yard down to the curb. Above the paver wall, there was the second level (which was at house foundation level) — this second level also contained wall-to-wall grass. The grass was dried out just before the re-landscaping for easier removal. The top level was pretty bare. Just a few plants along the house, none of which were nice to look at. No curb appeal here. Only the water-loving grass, which has now been burned out and dried for removal. Both levels were completely transformed. The grass was removed, along with a layer of soil. In its place, beautiful and calming curved borders were created with mulched planter areas containing drought-tolerant, water conservation oriented plants. All the plants were put on an automatic drip irrigation system for carefree maintenance. Decomposed granite was installed in the newly created walkways, along with flagstone steps bordering the curb. Here is a reverse view. You can see how the mulch around the tree protects it from the elements and keeps the soil moist from the drip irrigation, along with adding a beautiful contrast color with the reddish mulch. The rows of water-conserving plants have a lush feel, even though they are very cost effective. No worries now about the public parking along your grass and stepping on grass. The step stones take care of it for you. And with the step stones being flagstone, you also get a home upgrade feature. On the top level next to the house, the bushes alongside the house were replaced with bushes that will grow taller and fill in with color for pollinators. Veggie garden planters were installed with automatic watering systems. Decomposed granite was leveled along the walkways, as well as larger flagstone steps going to the veggie planters. All the planter beds were heavily mulched and stocked with more native and water conservation oriented plants, making for a carefree landscape that saves the client on his water bill and also looks great!